Manchester United goalkeeper David de Gea is reportedly indicating he’s ready to commit his future to the club and sign a new contract. 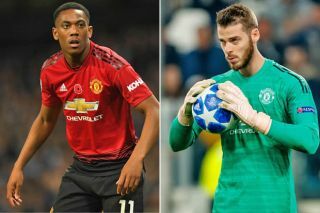 According to the Daily Mirror, De Gea had been unconvinced about the direction United had been going in under previous manager Jose Mourinho, but things have improved a great deal very quickly under interim boss Ole Gunnar Solskjaer. The Spain international is arguably the best player in the world in his position, and has long been one of the most important player in this Red Devils squad. If it’s true that he’s now ready to stay at Old Trafford then that could be huge news for the club as they look to make progress after a difficult few years in the post-Sir Alex Ferguson era. For a player of his calibre, De Gea’s trophy haul as a United player is surprisingly low as his exceptional form has not been enough to lift this team to greater heights. Still, United will surely feel that by keeping him they have good foundations to build on for the future as they prepare for life under a new manager next season. Given the Mirror suggesting Solskjaer’s role in persuading De Gea to change his mind, that could just be another reason the Norwegian should be a strong candidate now to land the manager’s job permanently.